So what does it mean? Well, we know that Tyrion will be finding his way to Mereen a lot more quickly on the show than he does in the Books, where he has yet to encounter Daenerys — in fact, several set pictures of filming have shown Tyrion at her side during pit fighting sequences that book readers will be familiar with, but the poster is our first official confirmation that the two characters will be meeting each other, a huge change from how the books are currently progressing (as of A Dance With Dragons, Tyrion has yet to meet up with Daenerys, and is currently just outside Mereen as a battle between between Daenerys’ forces and several slaver’s armies ensues). In the recent meetings with media companies, the Apple executives, including Senior Vice President Eddy Cue, have outlined new ways Apple’s technology could recognize users across phones, tablets and TVs, people familiar with the talks said. In at least one meeting, Apple described future television technology that would respond to users’ voices and movements, one of the people said. Such technology, which Apple indicated may take longer than some of its other ideas, might allow users to use their voices to search for a show or change channels. This is going to be big. Even though its competition has warning of Apple’s plans, I don’t think they understand the scope of Apple’s plans. It causes practical problems, too: TVs usually require large warehouses and very large retail display areas, which Apple’s retail stores aren’t ideal for. And large TVs usually require in-home service, which Apple doesn’t offer for any other products. How often do people buy new TVs? Apple’s primary business is selling computing devices and related hardware, with healthy margins and tightly integrated experiences, to customers who generally replace them with the newest models every 1-3 years. There’s no place for them in the TV market, and they’re content (and smart) to stay out of it. Q: Is it time to throw out the interface for TV? Does television need a new human interface. A: The problem with innovation in the TV industry is the go-to-market strategy. The TV industry has a subsidized model that gives everyone a set top box for free. So no one wants to buy a box. Ask TiVo, ask Roku, ask us… ask Google in a few months. The television industry fundamentally has a subsidized business model that gives everyone a set-top box, and that pretty much undermines innovation in the sector. The only way this is going to change is if you start from scratch, tear up the box, redesign and get it to the consumer in a way that they want to buy it. But right now, there’s no way to do that….The TV is going to lose until there’s a viable go-to-market strategy. That’s the fundamental problem with the industry. It’s not a problem with the technology, it’s a problem with the go-to-market strategy….I’m sure smarter people than us will figure this out, but that’s why we say Apple TV is a hobby. 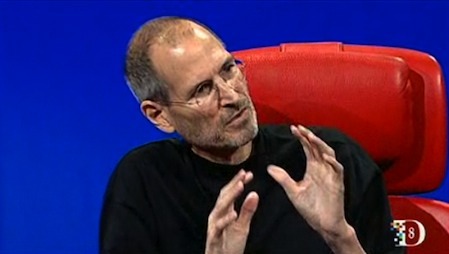 So Jobs doesn’t believe an “additional box” is a viable strategy for seriously entering the TV industry. This leaves three places to enter: 1) integrating into set top boxes, 2) integrating into other TVs, or 3) Apple creating its own TV. Regarding #1, the last thing the cable operators want is for internet-delivered programming that bypasses their cable channels to become widespread – they see that as the fast track to become a dumb pipe. Re #2: This just seems very unlike Apple – the most vertically integrated company in tech, and famous for wanting to control every aspect of the product and user experience. 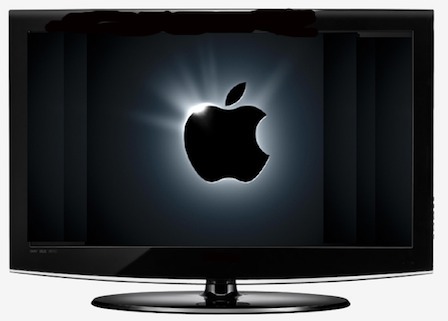 Re #3, let’s imagine Apple develops a TV that is as groundbreaking as the iPhone was. The biggest problem “smart TVs” have today is that they need clunky IR transmitters to control set top boxes because the cable operators won’t willingly interoperate. So a new Apple TV would have to drum up such incredible consumer demand that the operators would feel compelled to support it. This does indeed seem harder in the TV than in the mobile industry. At least in the US you had 4 nationwide mobile operators at the time of the iPhone launch. In TV, consumers normally have at most two real choices for traditional cable programming – cable and satellite – and two real choices for two-way internet – cable and DSL/FIOS. Perhaps Apple won’t enter the market due to its structure. But that didn’t stop them in mobile phones where the structure was similarly difficult. The mistake analysts made about the iPhone was to assume the current industry structure would be sustained after Apple’s entry. I’d be wary of making the same assumption about the TV industry. I used to think Apple might get into this market — selling big high-quality TVs with built-in Apple TV functionality — based on the following logic: “Why settle for selling a $299 box instead of a $2000 TV set?” Now, of course, Apple TV is a $99 box. I agree with Marco — I don’t think Apple is going to get into the TV set business. “There’s money to be made” just isn’t reason enough.